Brown relates to stability and honesty. When we see brown we think of the earth since brown is the dirt under our feet. 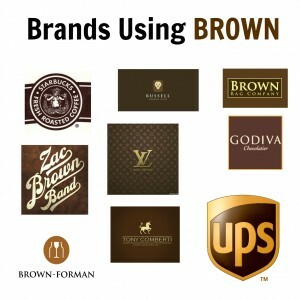 Companies that use brown are trying to make consumers think they will get the job done with a no nonsense attitude. Other times when companies use a silkier looking brown it is to symbolize class and eloquence. You can see brown being used by companies such as UPS or Louis Vuitton. Both use brown for very different reasons. UPS uses brown to show that they are no nonsense and will get the job done. Lighter, more creamy browns are used in the Louis Vuitton logo to symbolize wealth and luxury.